As a third of the Sa-Ra Creative Partners, Shafiq Husayn has produced some of the most acclaimed nu-soul spirit music of recent times, lending his sought-after cosmic vision to albums from John Legend, Erykah Badu and even Ice T. Now striding out on his own for a solo production - 'Shafi En' A-Free-Ka' - he can set the immediate commercial pressures of the trio aside for an album of free-spirited astral journeying, taking underground MC legend Count Bass D, vocalist Bilal Oliver and members of Build An Ark and Sa-Ra along for the experience. 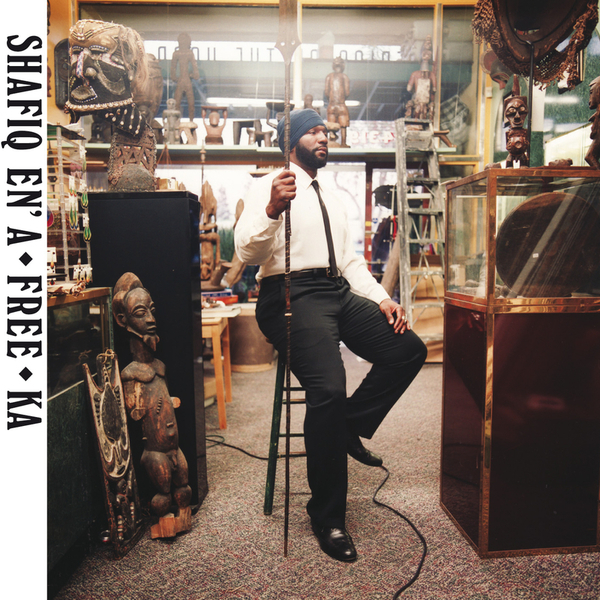 Shafiq takes a lot of cues from Sun-Ra over the course of the album, guiding him through seventeen tracks of jazz taught, soul soaked and hiphop bounced sounds using a huge array of engineers, players and like-minded cats to achieve his vision. It's arranged with the sense of a classic studio album in the tradition of Stevie Wonder or Sun-Ra, benefitting from the bristling ebullience of the assembled cast but never losing its cohesion or joyful theme, making it a pleasure to witness. The psyched West Coast pop harmonies of 'Major Heavy' features Sly Stone sound-alike Sonny Coates duetting with Count Bass D, while Om'Mas Keith and Stephen "Thundercat" Bruner make one of the highlights on 'Changes' with head swirling keys and wicked broken beat futurism. A highly recommended set to anyone who fell in love with 'The 4th World' or yearns for more Carlos Niño!